FREE GIFTS WITH THIS WEEK’S ANGLER’S MAIL! DO NOT miss this week’s Angler’s Mail print magazine. It is in shops from Tuesday, July 9 and comes with a trio of terrific freebies, plus brilliant contents! FREE BIG PELLET WAGGLER – Angler’s Mail print magazine brings you a free big pellet waggler – taped to the cover of every copy. FREE ROD LICENCE – One-day licence voucher to take someone else fishing during National Fishing Month. FREE TICKET – Watch Fish’O’Mania final this weekend and save £5! 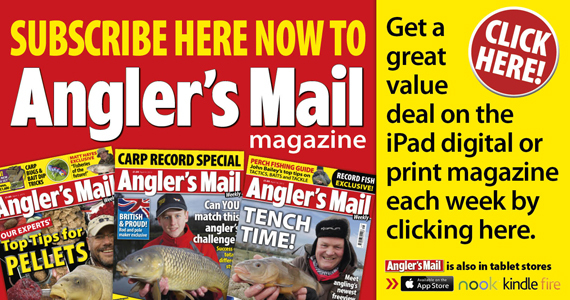 The Angler’s Mail print magazine costs £1.85 and is available in all good newsagents and supermarkets in the UK. Or why not make Angler’s Mail a part of your week, every week, by taking out a big value subscription – click below.